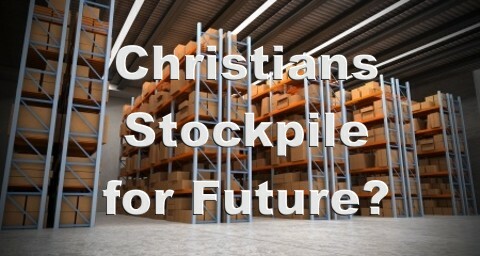 Should Christians Stockpile to Prepare for Future Disasters? Do you believe Christians should stockpile supplies and weapons for any futuristic disasters? Does the Bible give us any guidelines over such an issue? Jesus gives us a lot of advice for being stewards with what we have been given and that we should be investing in the kingdom by proclaiming the gospel of Jesus Christ, but what about an uncertain future where society is expected to grow worse and worse as the time of Christ’s arrival draws near? Is it permissible or even suggested that believers prepare for a future that is at best uncertain and at worst, believed to become drastically dangerous in which to live? I do not believe there is anything wrong with preparing for the future. We are wise stewards if we invest in eternal things but there is certainly nothing wrong with planning for the future and saving what we can. For one thing “it is required of stewards that they be found trustworthy” (1 Cor 4:2) and “if anyone does not provide for his relatives, and especially for members of his household, he has denied the faith and is worse than an unbeliever” (1 Tim 5:8) so not only should we be stewards with what God has given to us, we should be providing for the family that God has entrusted us with. When Jesus told the Parable of the Talents, He said that “he who had received the five talents came forward, bringing five talents more, saying, ‘Master, you delivered to me five talents; here I have made five talents more.’ His master said to him, ‘Well done, good and faithful servant. You have been faithful over a little; I will set you over much. Enter into the joy of your master” (Matt 25:20-21) but to the one who squandered his talents or didn’t even use what he had, Jesus will say “you ought to have invested my money with the bankers, and at my coming I should have received what was my own with interest. So take the talent from him and give it to him who has the ten talents” (Matt 25:27-28) “And cast the worthless servant into the outer darkness. In that place there will be weeping and gnashing of teeth” (Matt 25:30). Does this mean that we should stockpile in preparation for a highly uncertain future? There is a wide range of opinions on the question of whether or not Christians should stockpile foods or weapons to prepare for future disasters. Some say that we must fully trust in the Lord for our future but others believe that we should make plans to prepare for the unexpected since we know “that in the last days perilous times shall come” (2 Tim 3:1) and “that scoffers will come in the last days with scoffing, following their own sinful desires” (2 Pet 3:3) so the sinfulness of the world has been and will increasingly grow more wicked. Just how bad will it become? Paul tells us that “people will be lovers of self, lovers of money, proud, arrogant, abusive, disobedient to their parents, ungrateful, unholy, heartless, unappeasable, slanderous, without self-control, brutal, not loving good, treacherous, reckless, swollen with conceit, lovers of pleasure rather than lovers of God, having the appearance of godliness, but denying its power” (2 Tim 3:2-5). Jesus warned about the days just prior to His second coming, “But concerning that day and hour no one knows, not even the angels of heaven, nor the Son, but the Father only. For as were the days of Noah, so will be the coming of the Son of Man. For as in those days before the flood they were eating and drinking, marrying and giving in marriage, until the day when Noah entered the ark, and they were unaware until the flood came and swept them all away, so will be the coming of the Son of Man” (Matt 24:36-29). The fact is that no human knows when this day will come so we must be ready for His appearing to come suddenly and unexpectedly. Where is your True Security? The Most High is the dwelling place of safety, not an underground bunker for even these can be broken into and entered and so “In peace I will both lie down and sleep; for you alone, O Lord, make me dwell in safety” (Psalm 4:8) and we know that “God will supply every need of yours according to his riches in glory in Christ Jesus” (Phil 4:19) because God “is their stronghold in the time of trouble. The Lord helps them and delivers them; he delivers them from the wicked and saves them, because they take refuge in him” (Psalm 37:39b-40). For God will “bless the righteous, O Lord; you cover him with favor as with a shield” (Psalm 5:12) so “be content with what you have, for he has said, “I will never leave you nor forsake you” (Heb 13:5). If you have never had a time of repentance and faith in Christ, you have every reason to fear about the future. Without Christ, here are the end times for you: “And I saw the dead, great and small, standing before the throne, and books were opened. Then another book was opened, which is the book of life. And the dead were judged by what was written in the books, according to what they had done. And the sea gave up the dead who were in it, Death and Hades gave up the dead who were in them, and they were judged, each one of them, according to what they had done. Then Death and Hades were thrown into the lake of fire. This is the second death, the lake of fire. And if anyone’s name was not found written in the book of life, he was thrown into the lake of fire” (Rev 20:12-25) for “many of those who sleep in the dust of the earth shall awake, some to everlasting life, and some to shame and everlasting contempt” (Dan 12:2). Would you rather not have this said of you: “And those who are wise shall shine like the brightness of the sky above; and those who turn many to righteousness, like the stars forever and ever” (Dan 12:3)? More about the last days: Are We in the Last Days? “Preppers” are those who live off the grid in anticipation and “preparation” for post apocalyptic times. I often find their ideas interesting and somewhat compelling. On the one hand it is good to be self sufficient for water, power, food and shelter..not reliant on public utilities. I often wonder how long that environment would last if society ever broke down. Is your arsenal going to withstand roving bands of hungry men? Are you willing to shoot someone who wants food or water? Discussions abound on both sides. “For thy sake we are killed all the day long; we are accounted as sheep for the slaughter”(Ps 44:22). David is saying awake and save us(v.23) as he pours out his lament for the torment his enemies have poured out upon him. Yet, Paul quotes this same verse in the NT as if it is the Christian’s lot in life to wear this particular badge of suffering(Rom 8:26). My point, prepare to survive here on earth, but, more importantly… prepare to survive after death. An aside, I was listening to John MacArthur today on the radio and he asked the question of whether we were encountering clashes and rejection when sharing the Gospel. His follow up question was, “If not , why not?”. The Gospel is foolishness and the Cross an offense to those who are perishing(1 Cor 1:23,Gal 5:11). Yes, that is a hard road to walk in sandals my friend to remain meek and yet be persecuted and disdained, both in your face and behind your back. I think we tend to like the promises of God like He will never leave us nor forsake us and that He is always with us and that we can do all things thru Christ but the promises like you will be hated, if they persecuted Me they will persecute you, and all who live godly will suffer are the promises we don’t like to claim . Amen Doc to you very good closing in your comment…staying on our knees for Holy Spirit boldness so that this conflict is reconciled. Only God can help us do that. Thanks brother, as always, so encouraging.